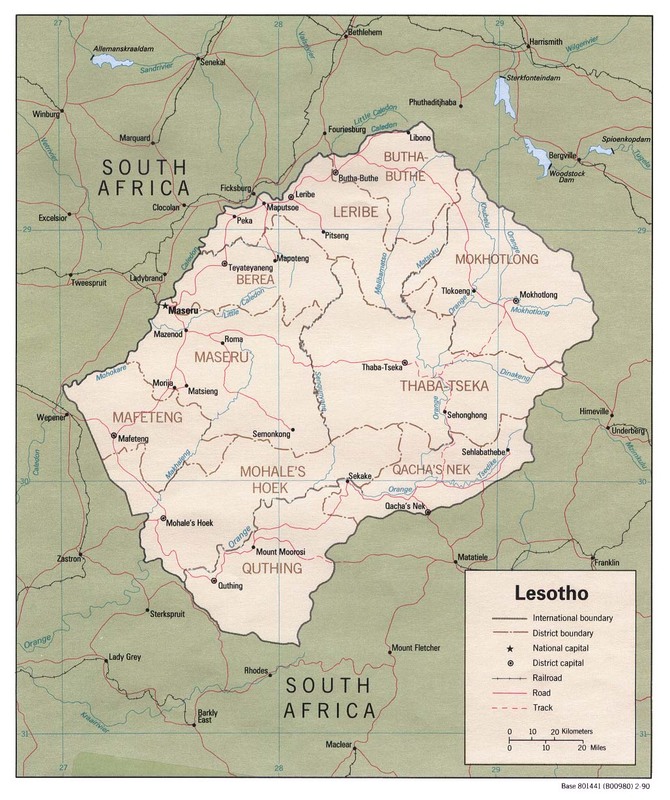 Lesotho (listen to pronounciation), officially the Kingdom of Lesotho, is a landlocked country and enclave—entirely surrounded by the Republic of South Africa. It is 30,000 km2 in size with a population of approximately 2,067,000 in 2009. Lesotho, "Kingdom in the Sky", is the only independent state in the world that lies entirely above 1,400 metres above sea level. Over 80% of the country lies above 1,800 metres. Its capital and largest city is Maseru. Lesotho is the southernmost landlocked country in the world. It is a member of the Commonwealth of Nations, the Southern African Development Community (SADC), and the Southern African Customs Union (SACU). The economy of Lesotho is based on agriculture, livestock, manufacturing, and the earnings of laborers employed in South Africa. Almost 50% of the population earn some income through crop cultivation or animal husbandry with nearly two-thirds of the country's income coming from the agricultural sector. Water is Lesotho's only significant natural resource. It is being exploited through the 30-year, multi-billion dollar Lesotho Highlands Water Project (LHWP), which captures, stores, and transfers water from the Orange River system and sends it to South Africa's Free State and Greater Johannesburg area. About 40% of the population live below the international poverty line of US$1.25 a day.The official currency is the loti (plural: maloti), but can be used interchangeably with the South African Rand. The population distribution of Lesotho is 25% urban and 75% rural. The main language, Sesotho (or Sotho), is also the first official and administrative language, and it is what Basotho speak on an ordinary basis. English is the other official and administrative language. Christianity is the dominant religion in Lesotho. Roman Catholics represent 45 percent of the population, Lesotho Evangelicals 26 percent, and Anglican and other Christian groups an additional 19 percent. HIV/AIDS constitutes an alarming threat to Lesotho and its people. The overall adult prevalence is estimated to be 23%. HIV/AIDS is not the only barrier to Lesotho’s economic development. Land degradation, capacity depletion, and economic decline are major obstacles to short- and long-term responses to humanitarian and development needs. "The ownership of all water within Lesotho is vested in the Basotho Nation. The Government of Lesotho has the duty to ensure that this resource is used in a sustainable manner and to the benefit of all users, and the responsibility to provide security of access to water sources and improved sanitation." "All the Basotho are entitled to have access to a sustainable supply of potable water and to the provision of basic sanitation services at an affordable cost." Lesotho Water and Sanitation Policy, Ministry of Natural Resources, 2007. Use of sanitation facilities during 2008 is 25% in rural areas and 40% in urban areas. responsible for 14% of deaths of children twelve years and below. accounted for 3% male and 5% female deaths in the same year. during the first quarter, in 396 cases children couldn’t attend classes of 2007 due to illnesses caused by intestinal worms: in an ambiance of poor health, children are unable to fulfill their education potential.